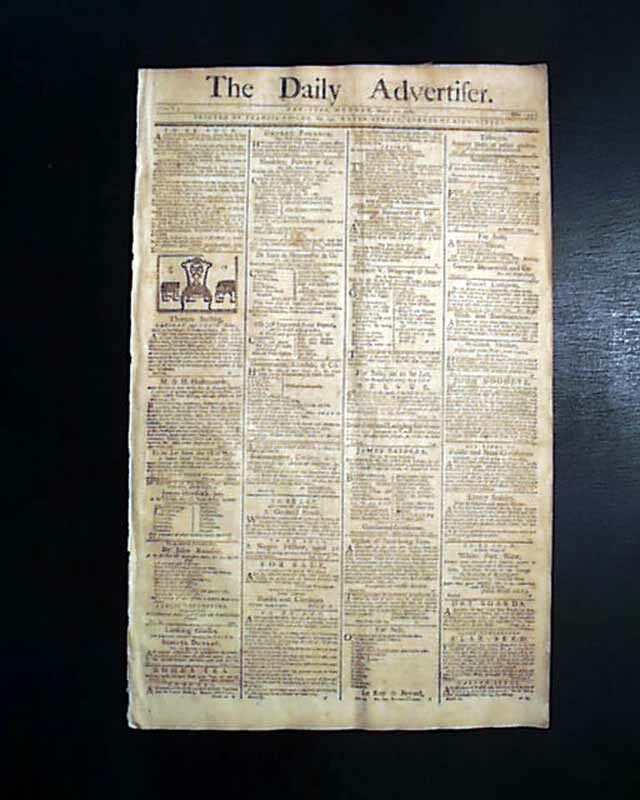 Pages 2 and 3 have much reporting on the earliest days of the federal congress (first sat on April 6). 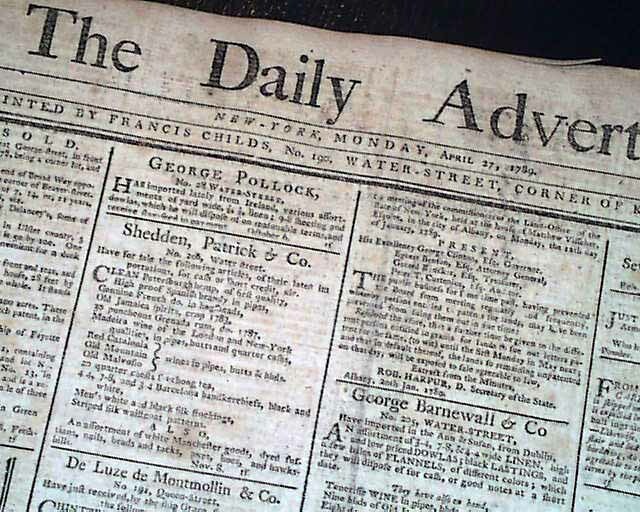 At the end of their work of April 25 was preparation for the inauguration of George Washington, just 3 days away from the date of this issue. 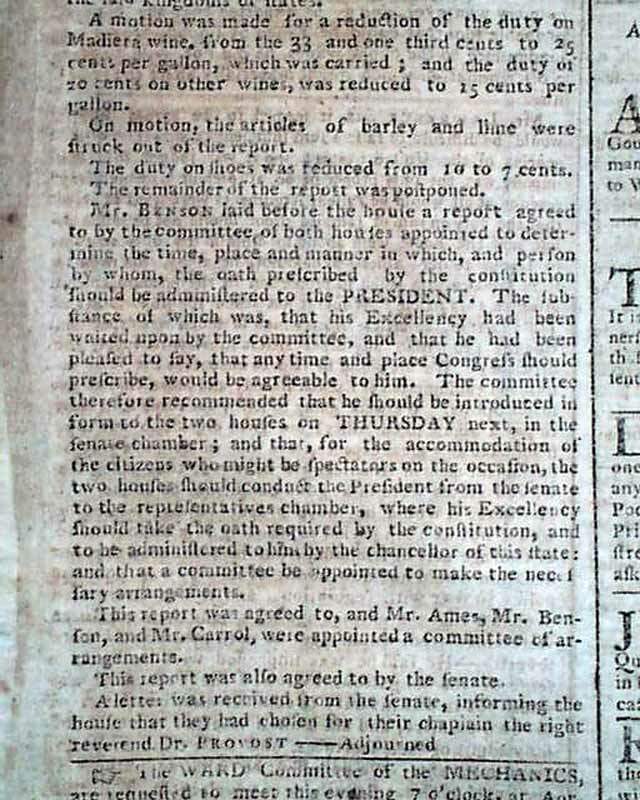 Text includes: "...laid before the house a report agreed to by the committee of both houses appointed to determine the time, place and manner in which, and person by whom, the oath prescribed by the constitution should be administered to the PRESIDENT...the committee therefore recommended that he should be introduced in form to the two houses on THURSDAY next, in the senate chambers; and that, for the accommodation of the citizens who might be spectators on the occasion, the two houses should conduct the President from the senate to the representatives chamber, where his Excellency should take the oath required by the constitution, and tio be administered to him by the chancellor of this state: and that a committee bed appointed to make the necessary arrangements..." with just a bit more. It then concludes with a very historic note announcing the appointment of the very first Chaplain of the Senate: "A letter was received from the senate, informing the house that they had chosen for their chaplain the right reverend Dr. Provost." (see).